Trivia: The photo shows the railway overpass running right through Delft's historical city. 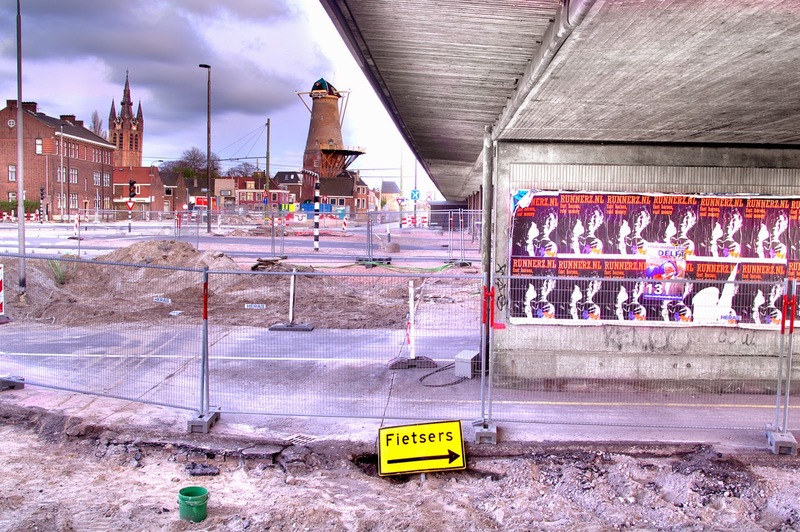 For Delft's Big Dig - putting the tracks underground - the historical windmill de Roos is in the way. The tunnel builders seriously considered breaking it down and rebuilding it stone-by-stone; eventually they considered it "too damaging to the historical nature of the monument". So they will now rebuild the windmill's foundation, put it on steel legs and jack it up one meter to be able to work underneath it. When the tunnel is ready, the windmill and adjacent buildings will be lowered back into their original position. It's that simple ... ! ! !